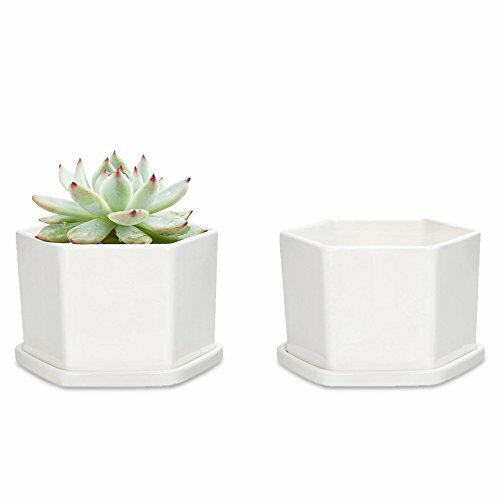 Size: 3 7/8"L X 3 1/4"W X 2 1/2"H.
Adorable mini size succulent planter pot made of ceramic with a white glossy finish.The clean and sleek design compliments most of the home and office decors. The bottom with ceramic tray,prevent mildew.Lovely gift item for any nature or gardening enthusiast. Size: Approximate Dimensions:3 7/8"L X 3 1/4"W X 2 1/2"H.
The bottom with ceramic tray,prevent mildew.Minimalist design small ceramic plant pots, perfect for adding modern flair to any tabletop surface. No plant included in this item!Mkono is a registered trademark and our product is professional manufacturing and sole selling.